Venerable enough to be praised with unfailing reverence in the masterworks of antiquity. Above all else - perfumed enough to waft its sublime scent down the ages. The rose has been famous enough to witness public ceremonies for thousands of years, and cherished enough to share mankind's private life each day. The rose is the pleasure of heavenly powers"
The pleasure of its company is an enduring satisfaction. No other flower so perfectly blends sensual grace and spiritual resonance. Its being is fluid - yet tenacious; naturally changeable - yet deeply rooted in the timeless power of nature. The rose is old enough - and wise enough - to wordlessly offer incomparable beauty - to hearten the existence of women and men in this daunting world. "To create a little flower is the labour of ages..."
With each succeeding era - floral avatars have emerged from the Genus Rosa: Blooms to reflect the aesthetic of their milieu, giving body to the moment's soul. When one of these flowering beings is invited into a garden, it vibrates with the breath of its original hour under the sun. Not a descendant ....it is the selfsame creature, fully alive and forever young at the present instant. The "old" roses are the elders of an extended tribe - which is accompanying our human race through the history of life itself. "Age is even more difficult to determine in plants that can be propagated by cuttings. If you remove a cutting from a favorite plant and root it in soil or water, when was it 'born'? When does it 'die'? If you take a cutting again from the newly rooted plant and re-root it? If the cutting was left in its original place on the tree or plant, it would eventually die; re-rooted it may live longer than the plant from which it came. If you re-root cuttings indefinitely, does the plant ever die?…..... You might argue persuasively that these plants are, indeed, immortal ." A genealogy spanning millenia makes the rose family tree one of the most fascinating and complex in botany. Century after century, the rose evolves ....elaborating its loveliness. The progenitors of the numerous rose groups are the Species, the simple wild roses found throughout the Northern Hemisphere. Beginning at the dawn of agriculture, various representatives of these ancestral plants were domesticated. Thus began the extremely long process of selection and manipulation of the rose - which relentlessly continues today. Modern roses have bright appeal, yet it is the true old roses which have an aura of charming experience and a halo of luscious grace. Forty centuries ago a few traditional bloodlines had already been established in the cradles of ancient civilization. Minoan frescos and Egyptian tomb garlands testify to the presence of recognizable roses. In the areas around the Mediterranean, a primitive form of the Gallicas was being grown for the medicinal virtues of its dried flowers. 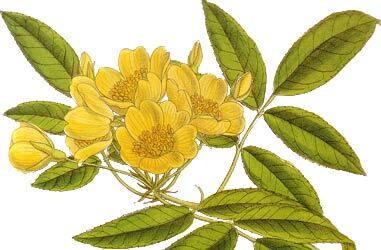 The exquisite Damask rose held an honored place - prized for the quality of its fragrant oil and the ability of a particular form to give flowers in Autumn. 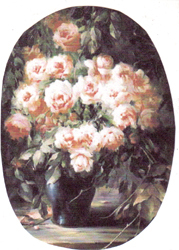 The Greco-Roman world is saturated with the fragrance of roses which were used to embellish all aspects of life. 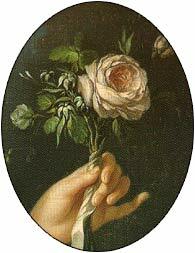 During the Dark Ages in the West, as the landscape was laid waste, walled gardens were able to preserve treasured heirlooms - among them the Rose. Parchment manuscripts were illuminated with brightly gilded roses twining round their letters; ladies embroidered their trailing gowns with its image, and their knights wore the Rose on their shields. Altars were respectfully draped with bloom - and spangled with the glowing light from glorious stained-glass ROSE windows. In Shakespearean times, the European Sweet Brier ((fairy-tale Eglantine with its apple-scented foliage) makes an appearance in A Midsummer Night's Dream, alongside the Musk rose of far-reaching fragrance. Around the mid 1700's in Holland, the Centifolias - so mundanely dubbed 'Cabbage roses' - reach a peak of floral perfection. 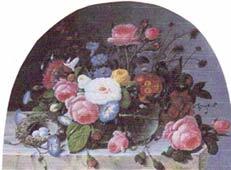 Lush still lifes of the period show the voluptuous charm of these magnificent blossoms -emblematic of a cozy richness pervading Dutch domestic life. Toward the end of the18th century, the Moss roses suddenly arise: astounding 'sports' of the Centifolias, their perfumed resinous buds prove once again that the Rose is endlessly inventive. Soon after, the Far East contributed Rosa rugosa, a remarkable Japanese wildling - distinguished by its vigor and huge nutritious hips. Then, at the very beginning of the 19th century, the four stud China roses are brought to England - and their trick of perpetual blooming begins to revolutionize the Western branch of the rose family. 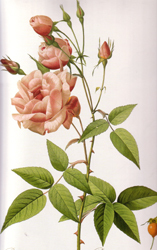 In France, Napoleon's Empress Josephine commandeers all the available species and varieties of rose for her Chateau Malmaison outside Paris......along with the gardeners and botanical scholars who would catalog - and vastly expand - her seminal collection. The renowned watercolors of Pierre Joseph Redouté skillfully document the individual flowers of this imperial endeavor. 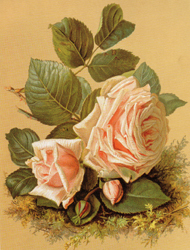 As the 1800's progressed, a surprising number of new rose classes came into being: the Chinas and Teas, Portland Damasks, Bourbons and Hybrid Perpetuals, Noisettes and Hybrid Musks, plus Ramblers and Climbers of myriad growth habits. The older rose types were dramatically invigorated by the fresh genetic material. Quality of scent remained one of the prime criteria for assessing a cultivar's worth, and all the subtle nuances of rose perfume find expression during this century. The sensitive tastes of the epoch shaped an aesthetic ideal of perfect refinement...... 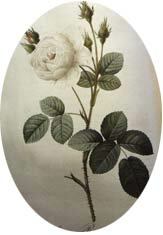 The cream of these 19th century roses are among the most beautiful creations in the plant world.
" This true old Rose scent, the scent that has charmed humanity from time immemorial is assuredly the most exquisite and refreshing of all floral odors - pure, transparent, incomparable...... an odor into which we may - so to speak - burrow deeply without finding anything coarse or bitter , in which we may touch bottom without losing our sense of exquisite pleasure.And this is far from being the case with all fragrant flowers. " The development of the modern Hybrid Tea rose actually began in the 1870's: the earlier ones retained much of the bloom quality, and the pronounced fragrance, of their forebears. 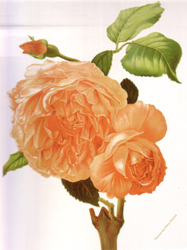 However, as the 20th century wore on, the hybridization of roses - like so many aspects of life - became industrialized. Factory-produced flowers became a fact of life. The rose, which had always served as an expression of the values and desires of its culture, gradually came to manifest those of modern times. There continued to appear valuable high points among the roses used for Bedding - on occasion, this class was capable of producing real quality and significant horticultural interest. Nevertheless, the majority of rose introductions scarcely measured up to the standards of the past. Their sometimes garish colors, disease susceptibility, and frequent lack of decent scent could be quite disappointing. Commercialized rose breeding - with its narrow vison and assembly-line scale - seemed to have entered a cul de sac. "In gardening terms, I think there is an unfortunate tendency to reduce the art of horticulture to matters of color, texture, and shape, and to reduce the plants to the interchangeable 'plant materials' or 'growies' of landscape architecture classes..........For the plantsman, and this is perhaps how we define him, the interest of the plant is not exhausted by its color, size, shape, or botanical definition. The plant is 'funded' in Dewey's words, with meanings...Disregard of meaning is often associated with idolization of technical achievement. It is, perhaps, advancing age that makes me view the garden as a refuge from techniques rather than a place to display them." - Marshall Olbrich (1920 -1991) "Gardens in Youth and Age"
The development of so-called "reproduction roses" emerged in the last decades of the 20th century. Expanding lines of these intensively bred roses are now an overwhelming phenomenon in the mass marketplace. Calculated to combine the older forms and fragrance with repeat bloom and disease-resistance, this vaguely mannerist formula has been a smashing success. Still - these new types partake of the commodified spirit of today's world - and emanate an indefinable air of being "virtual" old roses. In some curious way they risk the monotony of perfected product. That said....... a few superb exemplars will undoubtedly become future classics. Nevertheless let us not forget that the Portland Damasks,Bourbons, Hybrid Musks, or the Chinas and Teas offer their own rosy blend of virtues plus the soulful distinction of maturity. 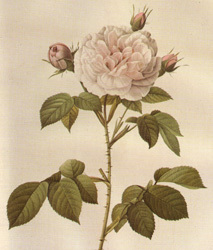 In addition, there are many eccentric rose characters classed as Modern Shrubs: they rise to high horticultural demands - and do so with individual style and unique panache. All of these roses, along with the charmed category of divine little Sweethearts, can fill special niches in everyone's garden. The next Horti-business frontier will presumably involve genetically engineered roses. Not something one really wishes to contemplate....... Let's not go there. The sheer length of the Rose's connection with humanity has forged a powerful link. While the old roses are sometimes referred to as "antiques" - that scarcely captures the duration and depth of the relationship. An antique needs only to have existed one hundred years, and most of the rose family is of a far more impressive vintage than that. 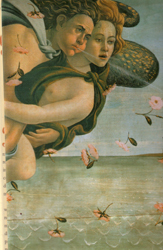 They are not only the bearers of myth and romance, but reveal the sensibilities of bygone days.